Albury Street looking east towards Creek Road in the 60's? Look how they dug up the cobble stoned street. 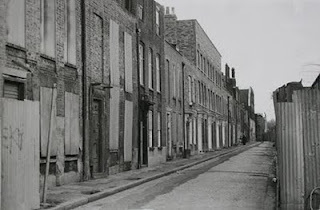 Albury Street had one of the finest cobbled streets in London. You can also see where the door brackets have been removed on the l/hand side.